In corporate law, a stock certificate (also known as certificate of stock or share certificate) is a legal document that certifies ownership of a specific number of shares or stock in a corporation. Historically, certificates may have been required to evidence entitlement to dividends, with a receipt for the payment being endorsed on the back; and the original certificate may have been required to be provided to effect the transfer of the shareholding. Over time, these functions have been rendered redundant by statutory schemes to streamline the administrative burden on corporations, and to facilitate and streamline trading on a stock exchange. 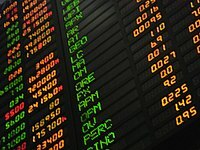 For example, most jurisdictions now impose an obligation on corporations to pay dividends to shareholders registered at a relevant point of time without the need to produce the share certificate as proof of entitlement and the certificate is no longer required to be produced with a transfer of a shareholding. In some jurisdictions today, the issue of paper stock certificates may be dispensed with, at least in some circumstances, and many corporations now provide a holding statement in lieu of a share certificate for each parcel of shares owned. Most jurisdictions now require corporations to maintain records of ownership or transfers of shareholdings, and do not permit share certificates to be issued to bearer. Ruben Schalk, history student at the Universiteit Utrecht, discovered (2010) the so far oldest share certificate in the world in the Westfries Archief in Hoorn. The certificate dates from 9 September 1606 and was issued by the VOC-chamber Enkhuizen. It was sold to Pieter Hermanszoon Boode. The second page records the payments of dividend. In the United States and other countries, electronic registration is supplanting the stock certificate, with both public and private companies no longer being required to issue paper certificates. In the United States over 420 of the 7,000-plus publicly traded securities do not issue paper certificates. The United States' Central Securities Depository, the DTC, has continued to promote efforts to completely eliminate paper stock certificates, a process called dematerialization. Countries around the world have adopted similar initiatives with many countries setting deadlines for statutory dematerialization. Brokers may charge up to $500 for issuing a paper certificate, though this fee can be avoided by either holding share in street name (in the United States street name securities are securities held electronically in the account of a stockbroker, similar to a bank account) or registering shares directly with the stock transfer agent and having them issue the certificate. Another alternative to both paper and electronic registration is the use of paper-equivalent electronic stock certificates. Forty-seven states have enacted legislation equivalent to the Uniform Electronic Transactions Act, which formalizes equivalency for electronic signatures "in writing" requirements. This, together with the enactment of legislation permitting the use of "facsimile" signatures on certificates (such as in §158 of the Delaware General Corporation Law), has given rise to software as a service technology for private companies to create, issue and manage paper-equivalent electronic stock certificates. In Sweden, share certificates have been largely abolished, people using electronic shares instead (which are either registered in the share owner's name or in the share owner's broker's name). Share certificates may exist in Sweden, but only if the shares are not listed on any stock exchange in Sweden, and the availability of share certificates has nothing to do with voting in shareholders' general meetings. Sometimes a shareholder with a stock certificate can give a proxy to another person to allow them to vote the shares in question. Similarly, a shareholder without a share certificate may often give a proxy to another person to allow them to vote the shares in question. Voting rights are defined by the corporation's charter and corporate law. Stock certificates are generally divided into two forms: registered stock certificates and bearer stock certificates. A registered stock certificate is normally only evidence of title, and a record of the true holders of the shares will appear in the stockholder's register of the corporation. A bearer stock certificate, as its name implies is a bearer instrument, and physical possession of the certificate entitles the holder to exercise all legal rights associated with the stock. Bearer stock certificates are becoming uncommon: they were popular in offshore jurisdictions for their perceived confidentiality, and as a useful way to transfer beneficial title to assets (held by the corporation) without payment of stamp duty. International initiatives have curbed the use of bearer stock certificates in offshore jurisdictions, and tend to be available only in onshore financial centres, although they are rarely seen in practice. A stock certificate represents a legal proprietary interest in the common stock (in the sense of the general fund) or assets of the issuer corporation. The certificate evidences a chose in action against the issuer to collect dividends and usually to influence the issuer through voting pursuant to the issuer's charter and bylaws, which are often implied or incorporated by reference as terms on the face of the certificate. Stockholder rights are subject to the solvency requirements of issuer's general creditors and to any terms and conditions validly placed upon the face of the stock certificate which are part of the total agreement between the particular stockholder and the issuer. Stock certificates are transferred as negotiable or quasi-negotiable instruments by indorsement and delivery, and issuer charters typically require that transfers must be registered with the issuer (usually via the issuer's transfer agent) in order for the transferee to join as a member of the corporation. Registration of transfer is a type of novation. There are old company research websites that can determine, for a fee, whether or not an old stock certificate or bond certificate has collectible or redeemable value. ^ Todd Miller (25 September 2015). "Why Private Companies Don't Need To Issue Stock Certificates". Retrieved 3 February 2013. ^ Matt Krantz (25 May 2010). "Electronic records are replacing paper stock certificates". USA Today. Retrieved 7 September 2010. ^ "DTCC Proposes Steps to Move Ahead on Full Dematerialization of Physical Securities". 12 March 2013. Retrieved 3 February 2015. ^ "Note On Statutory Dematerialisation Across the European Union". Retrieved 3 February 2015. ^ Matt Krantz (10 June 2010). "Free paper stock certificates? It's possible but does take work". USA Today. Retrieved 7 September 2010. ^ Connie Loizos (6 March 2013). "Cofounded by Manu Kumar, eShares Aims to (Finally) Digitize Stock and Options Certificates". PeHUB. Retrieved 13 June 2013. ^ Ehrle, Clarence G. "The Uniform Stock Transfer Act". This page was last edited on 16 November 2018, at 09:55 (UTC).